If it tastes good, you’ll drink more. Staying hydrated is key to good health and flavoring your water with a refreshing ingredient like cucumber makes it easy to quench your daily hydration needs in a flash. Not only does cucumber make ordinary water taste unbelievably cool and crisp, but it pairs wonderfully with other fruits like lime, apple, and watermelon. It’s an elixir of life! Drinking cucumber water is a two-fold method for giving your skin that dewy glow. Cucumber contains silica, a mineral that keeps the skin soft and youth while drinking water ensures that your skin is well-hydrated. 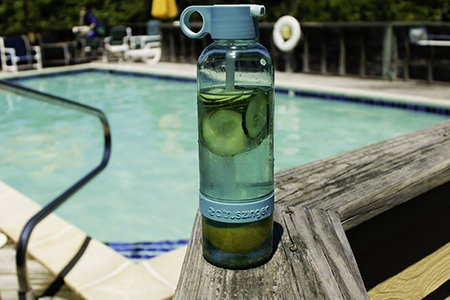 In fact, cucumber water is given out at spas because of its rejuvenation powers. A cucumber a day keeps the doctor away. Cucumber is rich in potassium and low in sodium which means it can help keep blood pressure stable. The silica in cucumber, in addition to smoothing the skin, is important for healthy muscles and bones. It’s a natural way to get your essential vitamins and minerals. In addition to silica and potassium, cucumber are full of disease-fighting antioxidants, as well as Vitamins C and K. Most of the nutrients are in the skin, so be sure to leave your cucumbers unpeeled. And if you want to boost your vitamin intake along with a little fiber, enjoy a cucumber snack after you finish off the water. It will help keep the weight off. Cucumbers are low in calories and sugar making it the perfect addition to any diet. The water-filled vegetable can also naturally ease bloating and help reduce water weight. Drinking cucumber water hydrates the body, makes you feel full, and is a healthy alternative to soda and sugary juices. Enjoy a cucumber cleanse. Cucumber contains citrulline which is thought to help the liver and kidneys filter out ammonia. Many detox recipes call for watermelon and cucumber combinations for their naturally cleansing compounds. The other vitamins and nutrients in cucumber, not to mention its refreshing taste, make it an easy choice for a healthy cleanse. For a quick and easy way to get your cucumber fix, try the Zing Anything slicer attachment. The slicer works with any standard Zing Anything water infuser. For more information, click here.